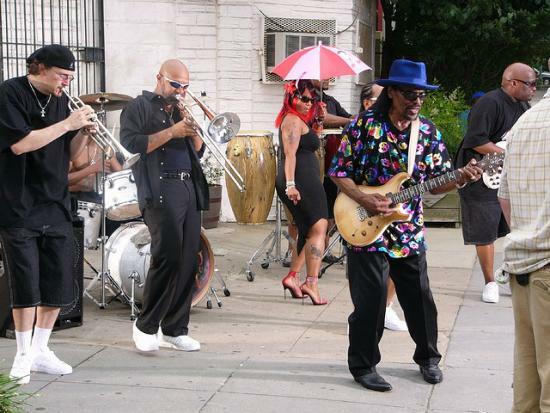 In the early 1970s, musical pioneer Chuck Brown began laying the foundation for a new and innovative sound in Washington, D.C., called go-go music. Driven by teenage musicians and audience members, the music was heavily inspired by funk, blues, soul, and salsa. It’s most identifiable by its syncopated polyrhythms and the use of multiple percussion instruments. Initially, “go-go” was the term used to identify the place where young people were partying. In time, the funky, homespun music became known as go-go music. Much like the birth of hip-hop in the Bronx during the same period (featured in the Places of Invention exhibition, opening July 1 in the Lemelson Center for the Study of Invention and Innovation), this new music was developed within a community that was experiencing significant economic hardships. During the 1980s, Washington, D.C., was described as a city with two population groups—the visible and the invisible. The visible group consisted of tourists, the Washington elite, the federal government, and professionals who flowed in and out of the city. The invisible group was the largely African American, blue collar group that made up a fairly high percentage of the city’s population. The music flourished because, much like blues and soul, it encapsulated the full range of experiences in these communities and brought joy as an inexpensive, fun, social expression. For most, the history of go-go music is synonymous with the history of the people that created it and gave it life. From the time of its inception, go-go music has existed as a raw, cultural asset that is owned equally by all of its D.C. fans. If you listen carefully, within the raw percussion and the funky grooves, you’ll hear the heartbeat and humanity of a very proud D.C. community. Application Solution Provider & 301-343-8566.